COVENTRY TWP. Loud noise and Airbnb homes have been a hot topic in Coventry this summer. During the Aug. 9 board meeting, trustees heard from several residents with concerns about the restaurants on the Portage Lakes and Airbnb homes in the township. Resident Pam Wayland thanked the residents who raised concerns about Airbnb homes in Coventry as she had no idea it was happening in the township. She owns several properties, but does not do short term leases. She brought up about how Bath Township addressed the issue and doesn’t understand why Coventry is taking so long to follow. Trustee Tom Seese said the township is working on the issue and is trying to find out the addresses in the township are marketed through Airbnb, an online site for short-term rentals. He said it is important to note the township isn’t going after all rentals, just those which are short-term. Resident Lisa Fouser said she had a meeting with Trustee Edward Diebold about the issue. She admits the issue isn’t an easy one to deal with, adding she would like to see property owners be required to at least rent their homes for 30 days. The other issue residents are brought up are noise complaints from restaurants on the Portage Lakes. Seese said he has been talking to homeowners near the businesses and he said there are some who are not bothered by it. Seese said he tries hard to look at both sides of an issue. He said the taxes in the township are already too high and he doesn’t want to shut down businesses and have to ask for more money from residents. 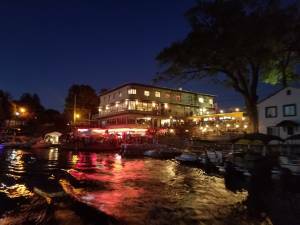 Seese said the waterfront restaurants have been busy and he believes that is a good thing. Resident Vicki Rodgers, though, voiced concerns about bands playing loud and how she can no longer get any outside enjoyment out of her property on the weekends. She raised concerns about the giant screen being used to show the UFC fights. Pick’s At PLX is one of the restaurants that have been the target of complaints. Owner Donnie Boyer was present at the meeting and said he has been working closely with residents who have concerns. He said many nearby residents have his phone number and they can call with concerns. He said he also has staff going into neighborhoods to check the volume level when entertainment is going on. Boyer added the Summit County Sheriff’s Office has also been out to Pick’s and found no issues. He said Pick’s always closes at 1 a.m. even though it could stay open until 2:30 a.m.
“We don’t want to be a bad neighbor,” Boyer said. Trustee Richard Kutuchief said the township plans to stay on top of the issues moving forward. Seese said in the 73 years he has lived in the area, things are better than they used to be. – Approved for the township to be a Purple Heart Township as Larry Emery from Military Order of Purple Heart Chapter 699 accepted a proclamation from the township and performed a ceremony recognizing the dedication, service and sacrifice of individuals who have been wounded or killed in combat while serving in the Armed Forces. Emery presented the township with a flag and a parking spot sign for the township. – Approved the transfer of a D-5/D6 liquor permit from Portage Lakes Brewing Company to Gambrinus Beerery without having a hearing. Seese said the township hasn’t received any concerns or complaints regarding the license. – Approved the stock transfer of a C-1/C-2/D-6 liquor permit from Prachi11, which is doing business as Lakeview Market & Drive Thru without a hearing. Seese said the township also hasn’t received any concerns or complaints regarding this license. – Announced a request to vacate the right-of-way located between Avalon Hills lots 53 and 54, known as 793 and 799 Fowler Avenue on the north side of Fowler Avenue and extending into Hower Lake. The request came from adjacent property owner Dan Kendel at 799 Fowler Ave. He submitted the signatures of 13 residents of the neighborhood approving the vacation. – Heard from new Coventry Zoning Inspector Bill Meyerhoff, who said he is starting to learn the township. He has been working with former zoning inspector George Beckham. He said he has been learning the township by looking at it online on the county GIS system and also by driving through it. He said he is surprised how much diversity there is when it comes to the zoning map. Meyerhoff said he has big shoes to fill and is going to try to follow the path Beckham set forth. – Heard from Administrator Anna Bryant about the township’s new website. She said the website is live, but the plan is to add more content. Residents can sign up for an online newsletter, which will be coming in the future. – Heard from Seese that the Akron Baptist Temple may be moving into the Cornerstone Church. The next Coventry Township Trustees Meeting is set for 7 p.m. Sept. 13 at Town Hall.